The Milky Way consists of roughly 100 billion stars that form a huge stellar disk with a diameter of 100-200 thousand light years. The Sun is part of this structure, hence, when we look into the sky, we look right into a gigantic disk of stars. The vast number of stars and the huge extent on the sky make it hard to measure fundamental quantities for the Milky Way, such as its weight. 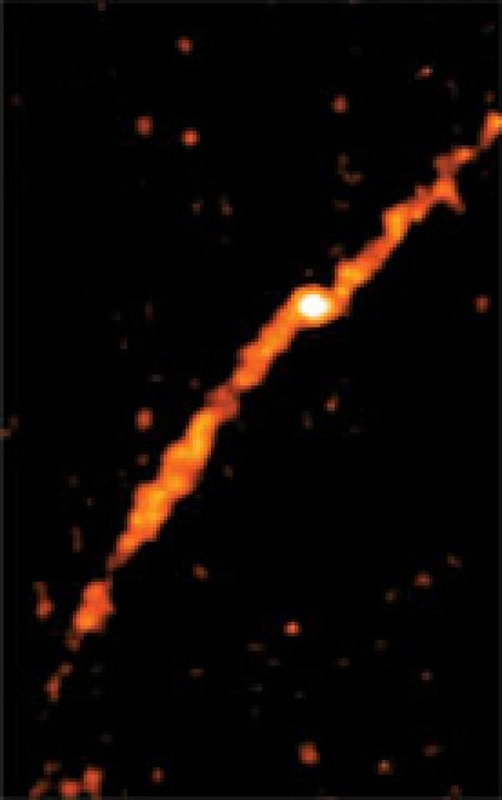 An international team of scientists led by Columbia University researcher Andreas Küpper used stars outside this disk, which orbit around the Milky Way in a stream-like structure, to weigh the Milky Way to high precision. In a new study published in The Astrophysical Journal, the team demonstrates that such streams, produced by dissolving globular clusters, can be used to measure not only the weight of our Galaxy, but can also be exploited as yardsticks to determine the location of the Sun within the Milky Way. "Globular clusters are compact groups of thousands to several millions of stars that were born together when the universe was still very young," said Küpper. "They orbit around the Milky Way and slowly disintegrate over the course of billions of years, leaving a unique trace behind. Such star streams stick out from the rest of the stars in the sky as they are dense and coherent, much like contrails from airplanes easily stick out from regular clouds." The image above shows one of the Milky Way's oldest inhabitants, the globular cluster known as Palomar 5 being torn asunder by tidal forces. Researchers say the observation, and others like it, could shed new light on the distribution of dark matter in the halo of the Milky Way. The researchers used data from the Sloan Digital Sky Survey, which scanned the sky of the Northern Hemisphere for about 10 years to create a comprehensive catalog of stars in the sky. The stream they tested the new technique on Palomar 5, and had already been discovered in 2001 high above the Galactic disk. Eduardo Balbinot, coauthor on the current study from the University of Surrey in England, revisited the Sloan data and detected density wiggles in the stream of Palomar 5. "We found the wiggles to be very pronounced and regularly spaced along the stream," said Balbinot. "Such variations cannot be random." It is these wiggles that allow the researchers to gain the unprecedented precision of their measurement. Using the Yeti supercomputer of Columbia University, they created several million models of the stream in different realizations of the Milky Way. From these models and from comparing the wiggle pattern of the models to the observations, they were able to infer the mass of the Milky Way within a radius of 60,000 light years to be 210 billion times the mass of the Sun with an uncertainty of only 20 percent. The unique pattern of the density wiggles helped significantly to rule out models of the Milky Way, which were either too heavy or too skinny. "An important advance in this work was using robust statistical tools – the same ones used to study changes in the genome and employed by internet search engines to rank websites," explained Ana Bonaca, a coauthor from Yale University. This rigorous approach helped in achieving the high precision in weighing the Milky Way." "Such measurements have been tried before with different streams, but the results were always quite ambiguous," added Professor Kathryn Johnston, coauthor of the study and chair of the Columbia Astronomy Department. "Our new measurement breaks these ambiguities by exploiting the unique density pattern that Palomar 5 created as it orbited around the Milky Way for the past 11 billion years." In the future, the researchers aim to use more structures like the Palomar 5 stream to gain an even higher precision and to create the most realistic model of the Milky Way to date. From the improved precision the scientists hope to learn about the formation and composition of our home galaxy, and to understand how the Milky Way compares with other galaxies in the Universe. So far, the results indicate that the Milky Way is a healthy patient – neither too skinny nor too heavy for its size. Lead author of the study "Globular Cluster Streams as Galactic High-Precision Scales – the Poster Child Palomar 5", Andreas Küpper, is a Hubble Fellow at the Astronomy Department of Columbia University. The Hubble Fellowship grants are awarded by the Space Telescope Science Institute, which is operated by the Association of Universities for Research in Astronomy, Inc., for NASA. Mystery Star Clusters of Elliptical Galaxy Centaurus A –"Something Dark, Hidden and Massive"